Yup thats right today is the day I leave for a long weekend in Columbus!! T-Minus 6 hours of work, and I am off! But Before I leave you all till Monday lets do a little challenge recap shall we? 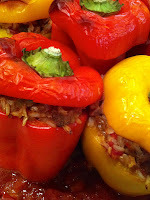 Lets begin with stuffed peppers, one of my favorite meals! Like baked potatoes, stuffed peppers can be made to please everyone in the family. The fillings are customizable! This recipe came from Women's Health and was Mexican Style! I personally liked them, my parents weren't to sure! We used a ground vegetarian substitute for the ground meat. While I liked this substitution you could tell that we didn't use "real" meat (the texture was different). I thought these peppers had some great flavor, but could use a bit more spice. The raisons were an interesting but lovely addition as they lended a sweetness to the cinnamon! I will be making these again, but adding a bit more spice! 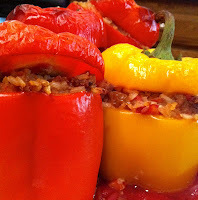 *Side note we did not make out stuffed peppers in a slow cooker, we simply baked them! 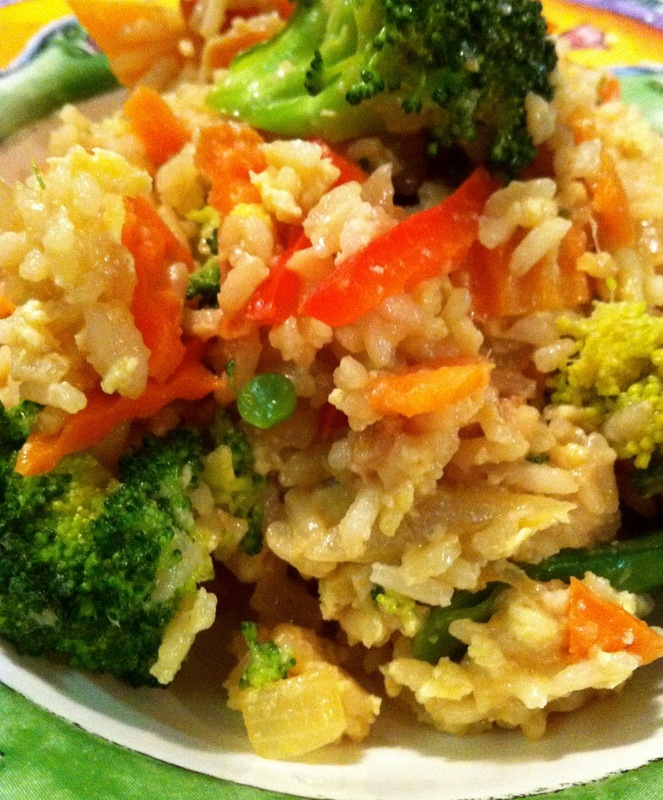 Oh yes a veggie packed fried rice. While this rice was no PF Changs fried rice it was good. I only used about 1/4 of a cup of soy sauce (a lot of reviews talked about how salty the dish was). While the fresh ginger was a nice touch of flavor I felt overall the dish could use a touch of something else maybe some garlic I haven't put my finger on it yet! The veggie factor was uped as well in this dish by adding broccoli and onions, great addition! So there you have it folks, two more recipes from the Pinterest Challenge. And with that I am off! I am ready to spend some quality time with my guy! See you all Monday, have a fabulous weekend! Wow, it all looks super yummy! Go you! Have an awesome trip!!! hope your mini vaca is off to a great start!!! Yay for you're trip! I hope you guys have a great time!! 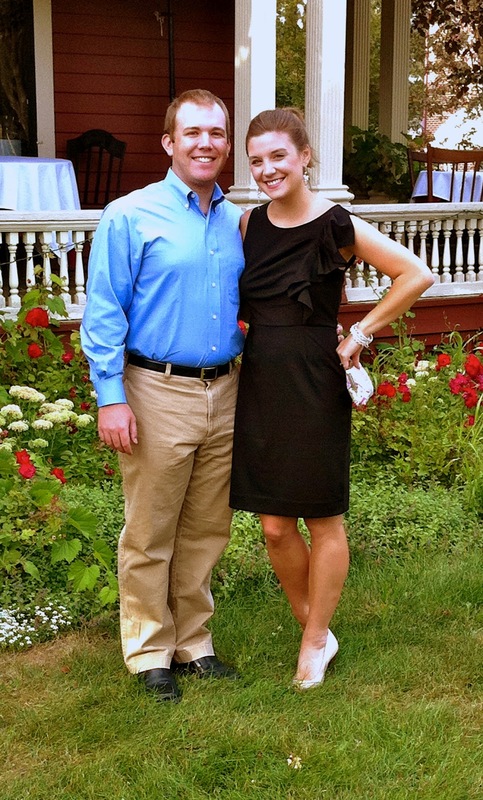 Have a great weekend... you guys look so cute together. I like the fried rice, i'm not a big fan of stuffed peppers - i'd probably side with your parents on this one. ;) ENJOY! have a happy valentine weekend with your man! I still have never made stuffed peppers.... I need to do this soon!! Have SO much fun!! Hope you brought a coat its cold here in OH!! I really need to get my booty in gear and attempt to eat healthier! Thanks for the recipes and have fun! Woo woo! Look at you and those healthy foods! Have a great weekend! awesome space you have with interesting posts.. It's only 7:30 am and you've made me so hungry for red peppers! :) Enjoy your weekend! The peppers look really good!! I hope you have a wonderful weekend with you man!! Stuffed peppers can be very healthy.